Medhi claimed this design goal was reflected in the smaller size, making it “easier to use and put away“, the LTE chip which “is supposed to make it easy to hop on and off the Internet” and even the optional Alcantara fabric keyboard, which makes the “tech feel a little more comfortable, a little warmer and a little more human“. While Medhi did not touch on these other items, we assume the small screen to body ratio which makes the tablet less immersive is also there to make you use it less, and the use of battery-sucking Intel chips vs ARM chips forces you to switch off after a few hours of use, while the use of eMMC storage should make users of the cheapest model so frustrated they will soon stop browsing Facebook. 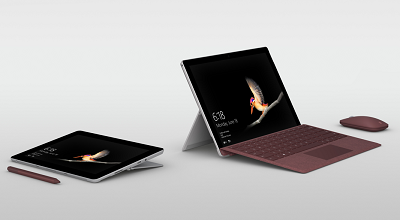 Microsoft’s new Surface Go tablet started shipping yesterday and is not expected by Medhi to help Microsoft breach the list of top-5 tablet OEMs.